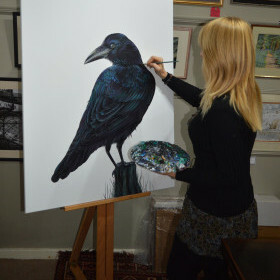 The Studio Art Gallery is ideally located next to the ancient part-thatched church of St Edmund King and Martyr in the market village of Acle, gateway to the Broads. They exhibit an exciting range of local artists’ and photographers’ works, both traditional and contemporary as well as hosting a programme of creative events including workshops. 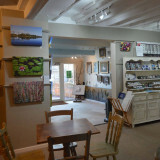 They stock a small range of acrylics and watercolours as well as locally sourced gifts, cards and hand made jewellery. The adjoining cosy tea rooms offer customers delicious cakes, refreshments, light lunches and snacks. The Studio Art Gallery adds a small voluntary donation on to the sale of art pieces and merchandise with the proceeds going directly to Love the Broads to be used as grants for projects which will keep the Broads special. We are both passionate about wildlife and the Broads National Park. So much so that I (Lorraine) chose to specialise in painting wildlife and we couldn’t wish a better place to live and work than at the heart of the Broads National Park.